John Gorrie was a 19th century Florida physician who supplemented his income by serving as a local postmaster, hotelier, notary public, and bank officer. When malaria and yellow fever swept the area in 1841, he dropped all his other responsibilities to seek a cure. It was believed that these diseases were caused by poisonous gas released by subtropical vegetation in the hot, humid air, so Gorrie proposed a two-tier defense: First, he convinced locals to fill in nearby swamplands, to prevent the gas from reaching the town. And second, he theorized that cooling patients' rooms and reducing the humidity could reduce their fevers and help keep the gas from contaminating the air. Cooling the room was a novel idea -- ice was a rare, winter phenomenon in Florida, and virtually unavailable beyond winter months, so Gorrie's challenge was to build a machine that manufactured ice. Over several years of research, he designed a steam-powered machine that compressed air in a small chamber, then released the pressure, allowing the air to rapidly expand and absorb heat from water surrounding the airtight chamber. As this process was repeated in a piston-driven process, heat was extracted from the water, making ice as it was cooled below freezing. To cool a small room, the ice was placed in a basin suspended from the ceiling, with a pipe above the basin extending upward through the ceiling and roof. As air contracted around the cold ice, it created enough vacuum to pull in outside air from the chimney pipe, and as this outside air was drawn over the elevated ice, heat's compulsion to rise forced the cooled air down into the room. Gorrie contracted with the Cincinnati Iron Works to build a working prototype of his ingenious invention, and filed his patent on 27 February 1848. He spent the next seven years searching unsuccessfully for financial backers to manufacture the machine, and died bankrupt. Of course, he was wrong about cooled air combating malaria and yellow fever -- diseases we now know are transmitted by mosquitoes. But modern refrigeration is descended from principles first put to use by Gorrie, and he is generally credited as the inventor of mechanical refrigeration, ice making, and air conditioning. A working replica of Gorrie's machine is housed in the John Gorrie Museum State Park in Apalachicola, Florida. 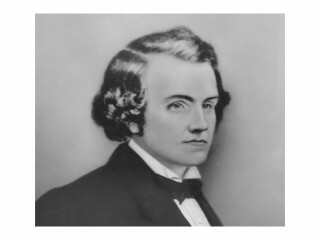 View the full website biography of John Gorrie.